Gretchen Cline, Ph.D., E-RYT, is the owner and lead teacher of Third Coast Yoga Studio and the Third Coast Yoga Level I Hatha Yoga Teacher Training program. A certified Yoga Therapist, she has studied yoga, meditation, Ayurveda and healing in depth through Hatha Yoga, Integrative Yoga Therapy, and 3HO International Kundalini Yoga programs. 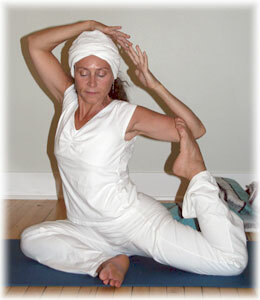 She completed her 500-hour level II in 3HO International Kundalini Yoga as taught by Yogi Bhajan in 2011. In addition she teaches both Hatha and Kundalini Yoga for college credit at Muskegon Community College. Gretchen has taught hundreds of classes and workshops to a wide range of students—from children to seniors to athletes to chemotherapy patients—and offers yoga to the public through her college’s weekly local television show, Yoga with Gretchen. She is committed to using yoga to help students in their recovery from addictions, and currently teaches yoga to troubled teens in the Ottawa County Juvenile Detention Center. She has experienced many Hatha Yoga forms, including Iyenger, Yin, Kripalu, Astanga, Anusara, Svaroopa, and Viniyoga. She has also taken workshops and teacher trainings from such yoga visionaries as Sean Corn, Gurucharan Singh Khalsa, Joseph and Lilian LePage, Pritpal Kaur Khalsa, Shakta Kaur, Ravi Singh, John Friend, Rama Berch, Sandy Carden, Paul Grilley, Gary Kraftsow, Scott Blossom, and many more. She also teaches a variety of other classes at Muskegon Community College, including Women’s Studies, Literature, and Writing. Oil painting is also an important part of her own healing journey. Her yoga therapy sessions and classes guide students through an experience of physical and psychological release so that they can know the delight and therapeutic well-being of this 5000+ year-old practice. Any BODY can experience yoga’s benefits of self-healing, self-expression, self-acceptance, and self-transformation.